Arguably the most famous and popular movie star of all time. 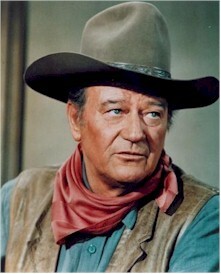 Note: John Wayne is a Hollywood icon and his genuine autographs are in great demand and hence are high value. With that demand is the temptation for fraud, in the form of autograph forgeries. One "red flag" indicating a forgery risk are unrealistic, low prices, far below market value. Read our report "Ten Warning Signs a Dealer May be Selling Autograph Forgeries".. Check out the online biography of this Hollywood legend. Quite interesting facts you have never known before.